Good news: Apple will soon announce the 5.5-inch iPhone 8 and 5.8-inch Plus model on September, 2017. In this update, Apple gets improvements in A11 processors, wireless charging, etc and appearance (all-grass body, OLED display). But, the highlight of iPhone 8 must be Face ID. As we know, Face ID will replace the traditional Touch ID to provide you with more secure iPhone unlocking and usability. This news will make many iPhone fans so excited. Because they can simply play their favorite movies and music videos on iPhone. 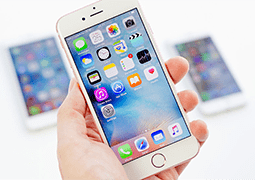 Surely, a functional and useful iPhone video converter is indispensable in the process of transferring video files to iPhone 6S/7/8/8 Plus. Before putting various videos to iPhone, the first thing you must figure out is whether you have prepared the compatible video files. If not, converting video to iPhone looks like pretty necessary; if you don't know, keep reading. Although there isn't any detailed information related to iPhone supported video/audio formats, it is very possible that iPhone 6S/7/8/Plus support the pre-existing video and formats. Video formats supported: H.264 video up to 1080p, 60 frames per second, High Profile level 4.2 with AAC-LC audio up to 160 Kbps, 48kHz, stereo audio in .m4v, .mp4, and .mov file formats; MPEG-4 video up to 2.5 Mbps, 640 by 480 pixels, 30 frames per second, Simple Profile with AAC-LC audio up to 160 Kbps per channel, 48kHz, stereo audio in .m4v, .mp4, and .mov file formats; Motion JPEG (M-JPEG) up to 35 Mbps, 1280 by 720 pixels, 30 frames per second, audio in ulaw, PCM stereo audio in .avi file format. In theory, common movies with .m4v, .mp4 and .mov file extension can well play on iPhone 8/Plus based on the foregoing information. But that is not entirely true. As is known to all, different video formats may have different video or audio codec. That is to say, though you import video to iPhone 8/Plus with the same file extension, it also can't play normally, not to speak of other common or HD video formats like MKV, AVI, MP4 MTS, FLV and more. Now, are you still sure you don't need a video converter for iPhone? Along with the improving HD video requirements, more and more Smartphone users want to freely watch high definition videos on phones. Of course, 4K Ultra HD videos can't be missed nowadays and 1080P/720P HD videos still are favored by movie fans. But on account of the limitation from video formats, many users don't know how to make those different format videos playable on the smartphone. Never mind. 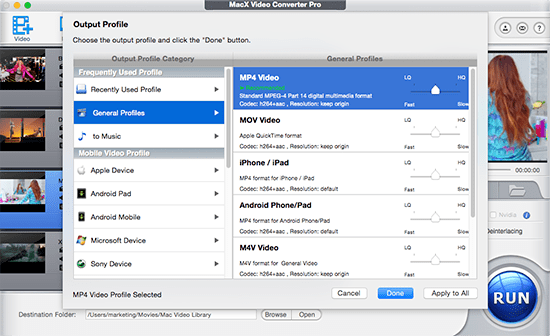 Here is an all-around video converter - MacX Video Converter Pro. With 370+ video and audio codecs, this video processing software is capable of converting any video to over 180 video formats and 14 popular audio formats, such as M2TS to MP4, MKV to MOV, FLV to M4V, AVCHD to MOV, MKV to MP4, MP4 to MP3, etc. What's more, it also can help you directly convert 4K/HD videos to iPhone due to its convenient preset profile settings for all generation of iPhone (including iPhone 8/Plus/X). 83x faster speed and zero quality loss. Before converting video, make sure that you have downloaded Mac version. And please download the Windows version if you are a PC user. Step 1: Run the software, click "Add Files" to load the video you want to convert. Step 2: Choose a video format for iPhone 8, like MP4, MOV, or M4V, which is the key step to convert video to iPhone 8 formats supported. Alternatively, you can select Output Profile > Apple Device > to iPhone Video to directly choose the iPhone 8 preset profiles. Step 4: Click "RUN" button to convert video to iPhone 8. Tips: If you desire to watch other YouTube 4K Ultra HD, 1080P/720P or other SD videos offline on iPhone 8, MacX Video Converter Pro offers you the best solution to download and convert YouTube videos to iPhone 8 at fast speed. If you hammer at watching local videos from Mac/Windows computer on iPhone 8/Plus, afunctional iPhone video transfer, MacX MediaTrans for example, will do you a favor. It goes beyond iTunes and lets you transfer any videos, no matter iPhone video format videos(MP4, MOV, M4V) or other videos (MKV, M2TS, WMV, AVI etc.) to iPhone.